Participants are the most essential factor of your experience research study. 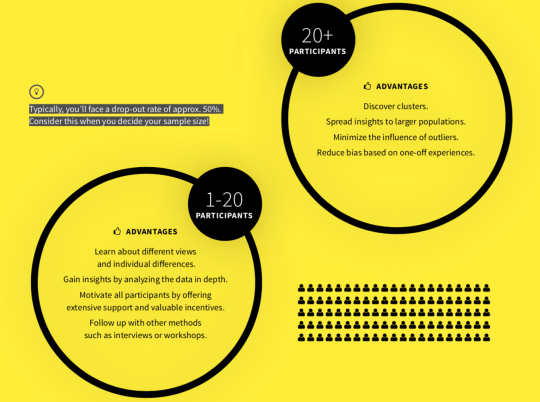 Here come 9 tips on participant recruitment and data quality in mobile ethnography projects. When should I invite my participants? Participants have an extended experience with your service, which also includes the pre- and post-service period. For instance, you could invite your participants via email days before they arrive at your venue to find out how their arrival was. How can I motivate my customers to participate? Reporting many experiences can be effortful for your participants. Providing them with an incentive can show how much you appreciate their effort. Giveaways, vouchers and raffles work very well as incentives. Also, offering customers updates on what you do with the data, e.g. how you improved the service, helps to increase motivation. How many participants should I invite? This depends on your research approach. There are advantages and disadvantages to the number of participants you invite to a project. How can I make sure I have the right participants? Before inviting all participants to your project, start with a small sample and see if you get the information you need. It is very helpful to conduct short interviews with your first participants afterwards, so you can adapt the invitation, their task, etc. How do I invite participants to my ExperienceFellow study? Click on “Invite participants” on your dashboard to find the project’s unique code – either in the for of a QR code or a token code. This is what your participants need to join the project – all participants use the same token to sign into your project. You can copy and paste both the QR-code and token code and place them on your participation invitation, e.g. mailings, posters, flyers, etc. Individual and personalized invitations work best. You’ll also find a simple PDF and HTML template in-app that you can draw on to create your own. What do the participants have to do? Participants need to use a mobile device to go to their app store (iOS or Android) and download the mobile app exp.fellow – the mobile app is available for free. With the app, they can either scan the QR code or type the token code you provide them with to get access to your project. Afterwards they can start creating reports right away. How much guidance do participants need? Name a contact person when you set up your project so that participants know who to ask if they have any questions. Participants see this contact information in the mobile app. Some written guidelines help participants. If possible you could even do an introductory interview to explain everything in person. You can also use push notifications within the mobile app to give specific instructions or reminders. How can I make sure my participants know what they have to do? Even though getting access and reporting experiences is easy, participants need a clear description of what they have to do. Explain the main aim of your research, provide clear instructions on how they should report their experiences, and what they should focus on in which level of detail. Depending on the project, you could ask participants to document whatever they think is important along their customer journey (e.g. their entire experience in a hotel) or ask participants to document a particular aspect rather in detail (e.g. the breakfast in a hotel). The WEC18 organizer team did an ExperienceFellow project to research the experience of event participants. They prepared a video tutorial to introduce visitors to the purpose of the project, to show how the app works and to make them aware of incentives. Learn more about the project of MPI. Birgit has worked in the field of services and tourism for over 10 years. After being responsible for market research at the Tyrolean Tourism Board she also works for MCI Management Center Innsbruck as a researcher.